Looks like all the trouble the Connor family got into fighting terminators over the years was for naught. 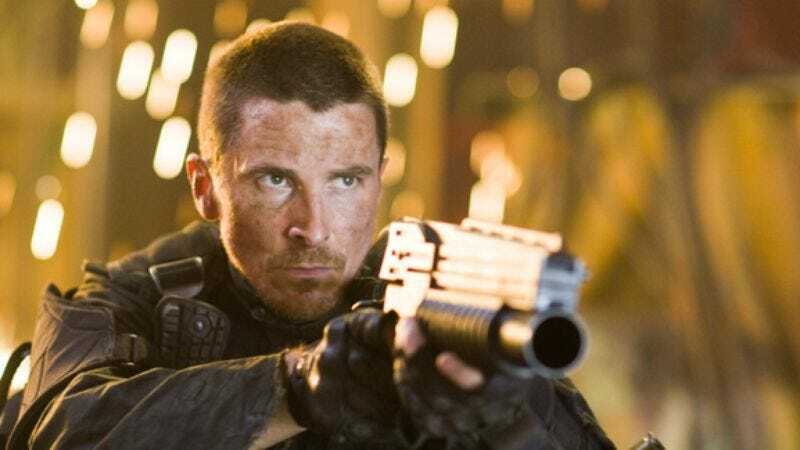 In the first three films and the recently canceled TV series, they battled robotic intruders—and an increasingly paradoxical timeline—to prevent a machine-dominated apocalyptic future, but Terminator Salvation takes place after that apocalypse has already happened. That’s the trouble with successful franchises: They keep on going long after the reason for going is gone. Unless, that is, watching humans battle terrifying machines is reason enough. And for much of Terminator Salvation, it almost is. McG launched his directing career with the Charlie’s Angels movies, mercilessly edited pop-art headaches that played like reverse-engineered Mad magazine parodies. But he shows up here ready to play by the series’ rules. The first two-thirds of the film features an array of impressive setpieces that bring the trademark Terminator action sensibility—quivering flesh and fragile machinery versus the pitiless approach of unfeeling circuits—into a dusty, post-nuclear hellscape on loan from The Road Warrior. It’s a grim world, and stepping in as once-and-future savior of humanity John Connor, Christian Bale gives it an appropriately grim hero. He’s joined by Sam Worthington, a man whose origins remain a mystery even to himself. First seen being executed for murder in 2003, he resurfaces in the post-terminator world via means he can’t explain. Guilt-ridden and confused, he sets about atoning for his sins, one bullet-ridden machine at a time. As long as McG keeps the action moving, the film remains on solid ground, matching and often surpassing the thoroughly adequate 2003 entry Terminator 3: Rise Of The Machines. He’s clearly immersed himself in the work of Terminator mastermind James Cameron, and Cameron’s relentless approach to action—juiced up by some state-of-2009 digital effects—serves him well. Eventually, however, the needs of story set in, and it becomes apparent how little the film, with its shallow characters and bellowed dialogue, has going for it beneath the clank of metal on metal. And it doesn’t help that the thrills leak out as McG’s feature-length Cameron homage devolves into apery. Maybe humanity isn’t fated to fall victim to machines, but Terminator films seem fated to end in steamy factories filed with molten lead and steel staircases. The way-too-familiar climax feels less like a comment on destiny than like watching a finely crafted but soulless product roll off an assembly line.